Charming 3 bedroom, 2 bath 1,690 sq ft transitional home located on a quiet cul-de-sac in Ascot Pointe in Chester. This home features a beautiful large living room with a gas brick fireplace, vaulted ceiling, skylights, and gorgeous exposed wooden beams! 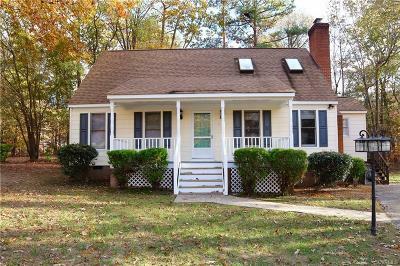 There is an eat-in kitchen with ceiling fan, newer black appliances, ceramic back splash, chair rail, and a bay window to let in plenty of light. There are three good sized bedrooms, and an additional room that could used as a den, office or rec room. Enjoy the great outdoors from the rear wood deck overlooking the huge back yard with detached shed for your additional storage needs. The back and front yards are both irrigated. This home is move in ready with a newer roof, newer HVAC, newer kitchen appliances and a newer hot water heater. Priced to sell ! Directions: I-95 South To Willis Exit Take Right On Willis Rd Left On Jefferson Davis Hwy Right On Kingsdale Left On Chester Rd Left On Paces Ferry Rd Right On Churchill Ct Property On Left. Selling Office: New Generation Realty Inc.